Mesomagor (C/R), Jan. 27, GNA – More than 3,000 inhabitants of Mesomagor, a farming community in the Assin South District of the Central Region were thrown into a joyous jubilation and ecstasy when a new mechanized water system was inaugurated. It was the first time the over a century that the community and its adjoining villages and hamlets have had access to clean portable drinking water. In its absence, residents were left with no option than to rely on nearby streams for unwholesome water, with its attendant consequences. 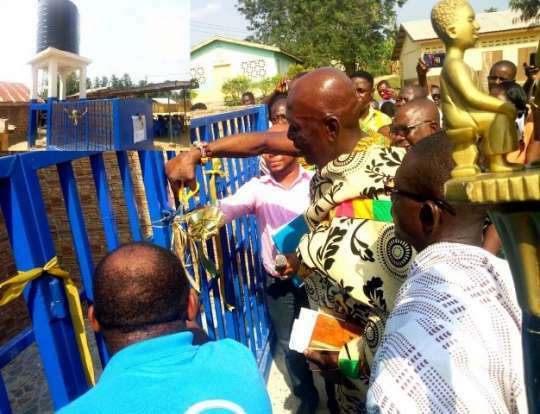 The over GH¢ 27,000 facility with a capacity of 10,000 litres per minute was initiated and funded by the Ghana Heritage Conservation Trust (GHCT) and the GHCT Advisory Committee in collaboration with the community. The GHCT which has the mandate to enhance the socio-economic growth of the communities around the Kakum Conservation Reserve Area, serves as a catalyst for development and a primary facilitator for the establishment of sustainable conservation, protection, maintenance and management of Central Region’s natural, cultural and historical heritage. Inaugurating the facility, Osabarima Kwesi Atta II, Omanhen of Oguaa Traditional Area and the Chairman of the GHCT Advisory Committee expressed the Trust’s determination to provide development projects to the forest’s fringes communities. He was excited that the facility will bring relief to the underprivileged and deprived communities and also help meet goal six of the Sustainable Development Goals which was aimed at ensuring availability and sustainable management of water and sanitation for all. He asked with the community leaders to zealously maintain the project to serve its purpose. Mr Derrick Owusu Ambrose, the DCE commended the contractor for the timely completion of the project and lauded the GHCT for coming to the aid of the community and urged that it extend its benevolence to cover more communities in the area. Nana Kojo Obeng II, Chief of Mesomagor expressed gratitude to the GHCT for the gesture and promised that the facility will he well maintained to serve the community for a long time.